Kitten Mittens - SOLD OUT, THANK YOU! HAND KNIT & PURRRL’ED FOR C.A.R.E. A great gift idea to keep your loved ones warm this Winter! 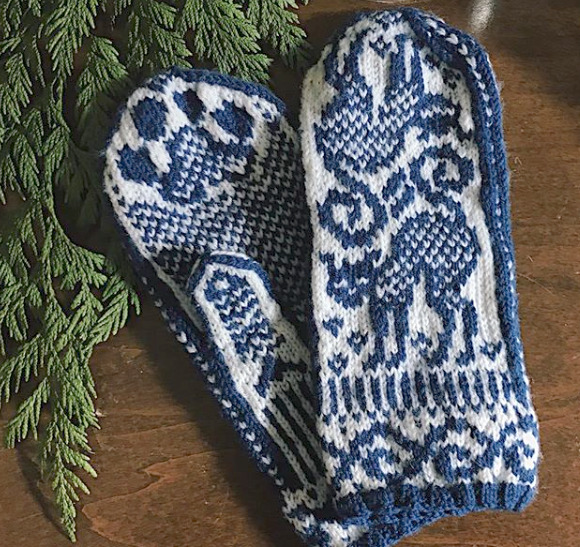 These Norwegian-inspired hand-knit Kitten Mittens feature two kittens — one facing up, one down. On the flip side, a paw print adorns the fingertips and a fishbone pattern along the thumb. Support C.A.R.E. by purchasing these special items by knitter Pam Moran. Kitten Mittens are available for a donation of $60. Limited quantity available. Shipping and handling is $7. 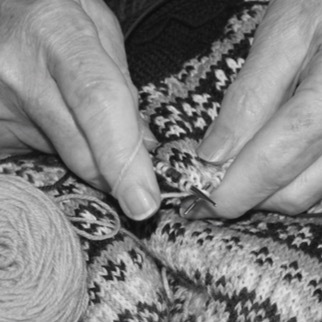 For me, knitting is a form of meditation. I follow the instructions, maneuver my needles and yarn, and quiet my mind until, almost magically, something tangible is created. When the world around me feels chaotic, I find that very calming. While by day I create big, energetic abstract paintings, at night, I’ll sit with my knitting in front of the TV. The orderly progression of stitches and rows makes a dramatic counterpoint to my painting and pushes me to use the other side of my brain. The colorwork makes me focus on one stitch at a time, forcing a leisurely pace. There’s no rush to completion. Seeing each pattern develop is a mini-adventure and, after seven to ten days, a pair of mittens — imprinted with kittens, paws and fish bones — materializes. Like the many cats and dogs C.A.R.E. cares for and finds forever homes for, each Kitten Mitten is unique. They’re made from different yarns, different needles, different color combinations. I’m so happy that these mittens might be enjoyed by cat-lovers and people who appreciate the invaluable work that C.A.R.E., an all-volunteer organization, performs. Each pair of mittens has been made and donated to C.A.R.E. to help it continue its important work of rescuing vulnerable animals. Kitten Mittens — some knitted from 100% wool, some from a 75% merino wool/25% nylon blend—should be washed in cold water by hand and laid flat to dry.